20 years ago, sunfish inhabiting Bali was hardly known to the world. Its is also true that our dive center opened in Candidasa 1998 without knowing the fact that sunfish were inhabitated. Looking at sunfish at the sea of Candidasa overlapped after a couple of years since opening and it gave me a chance to investigate sunfish. 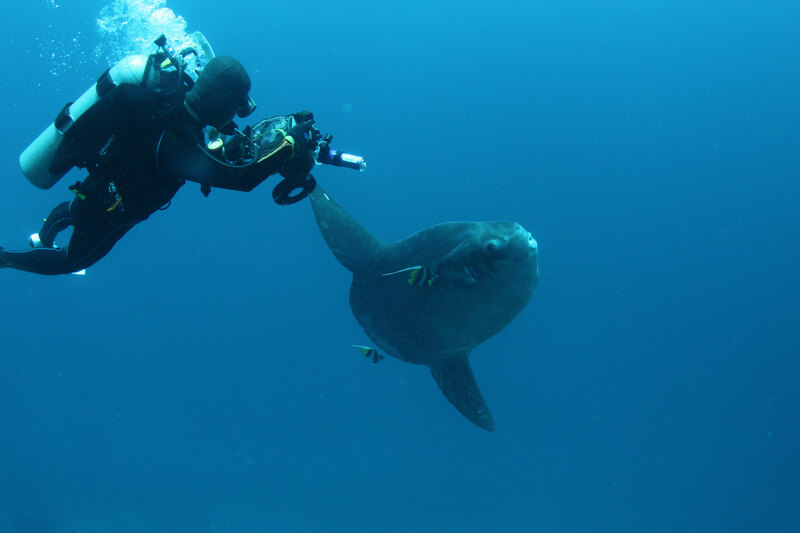 Then , I accumulated a record of sunfish encounter cases since 2003, probably first published a forecast of sunfish encounter in Bali on the website. The encounter with sunfish gives a wonderful impression which other creatures cannot taste. I would like you to enjoy sunfish dive in accordance with our rules, with the motto of not invading the sunfish's living environment extremely and observing sunfish. 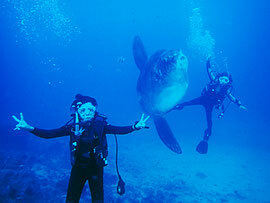 Total seven weeks 30days, When do you want to meet the Mola Mola(Sun fish)? On the first dive day participate in a check dive where dive sites are Tulamben ,Amed or Padangbai. Dive log number at least 100dives or more. Who can dive freely decent from a flowing water surface. Those who can freely take a neutral buoancy. The hotel in Candidasa is within walking distance of DIVELITE. Because sunfish dive is determined by the tide tabe, It may be early in the morning. It's a good idea to use our DIVE PACKAGES. Although the encounter rate with sunfish is about 70% against the prediction table. there is variation in the week when sunfish are seen. Please have a margin in the schedule. Inaddition,diving for sunfish dive for at least 3 days is essential(includes 1day check dive). 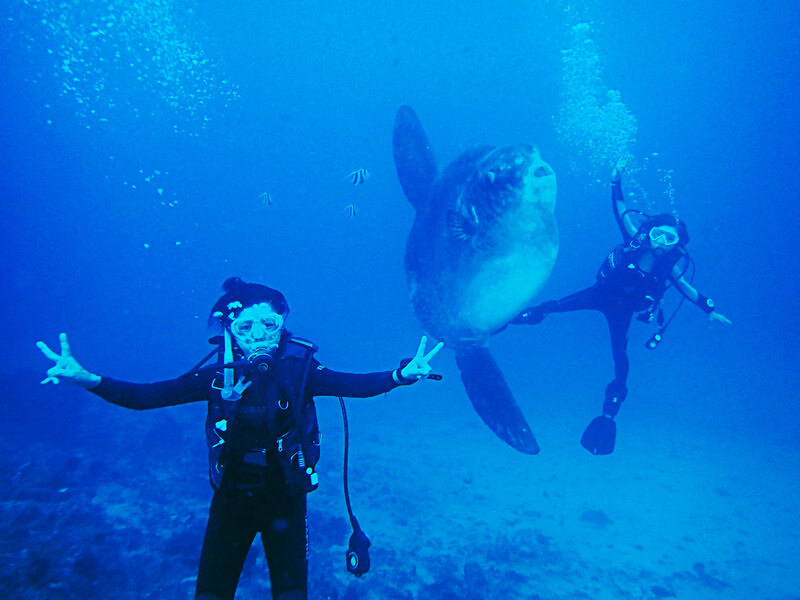 Our dive center is basically intended to encounter sunfish of less that 20 meters depth. Of course there are risks in diving, but we will not challenge diving such as v deep depth over 30 meters) or long dive time. The sunfish dive has low water temperature(23C or lower),and it's current to flow more strong. 5mm wetsuit and fins etc may not fitted , so bring your own concern if you are concerned. Also, dive-computers are essential. 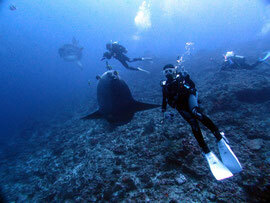 Our dive center will not commit the dive to the sunfish dive sites. It's depending on the situation of the sea and skill of divers. Those who compel the sunfish dive should rethink our use. [Safety First] , let's have a fun dive.